2015 has brought many changes to the Fond Blanc Orphanage. One of the most exciting changes is the full time presence of Brother Goulit. The children are thrilled to have Brother Goulit living in Fond Blanc as he is more than just a caregiver and role model, but is a friend too! We have known Goulit for several years, as an important member of Pastor Jean Claude’s congregation in Port-au-Prince. During the past two summers he served as a Translator on Next Step Ministries’ Summer Staff, and was part of many other off-season trips. Through this he has become increasingly invested in the lives of the children here in Fond Blanc. Goulit has built solid relationship with them in everything from directing band practice, to soccer practice, to helping them with their homework. When the time came to find an Operations Assistant, Goulit was the natural choice for the job. On January 1st, Goulit moved to Fond Blanc to begin his new position. 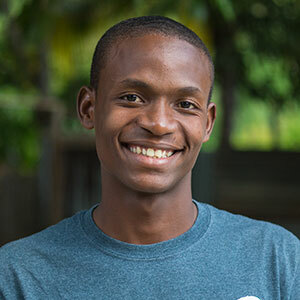 As our Operations Assistant, Goulit will help with many of the administrative and logistical duties of the foundation but most of his responsibilities include assisting in the implementation of the Foundation’s goals in the four main areas: love and care, health, education, and spiritual development. In his first month here, Goulit has worked with Alison to create some new morning and evening routines and to teach the children better hygiene. Simple things like monitoring bath time, providing soap, and new pajamas, will help tremendously with many of the issues the children face in their health and hygiene. Goulit is Haitian, which makes his role here vital. He bridges the cultural gap between the Foundation and our Haitian orphanage staff. He is well trusted and respected by the staff at the orphanage and has strengthened our partnership tremendously. We are excited to have Goulit as part of the Fond Blanc Foundation Staff and we cannot wait to see what this year brings for us all!.